LotFancy vet wrap is a strong and easy tear cohesive tape bandage, ideal for holding dressings in place or can be used when additional support is needed. Extra strength and security makes the pet vet wrap ideal for hoof bandaging. The self adherent tape sticks only to itself and won't stick to skin or hair. 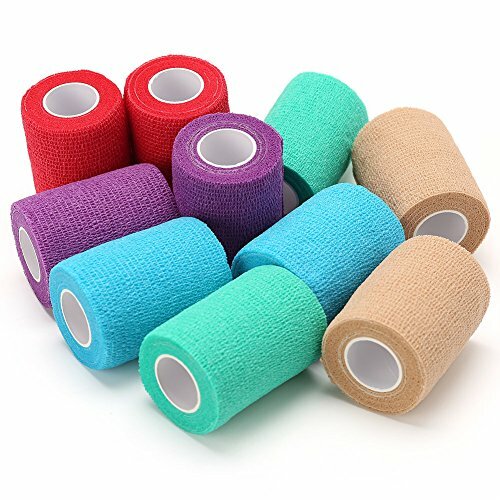 The cohesive tape will not constrict or shred and stays in place under most adverse conditions, suitable for dog bandages, horse vet wrap, cat bandages and other animals. Made of soft non-woven material, the pet wrap tape is your ideal first aid kit, offering protection and support for tendons and ligaments.